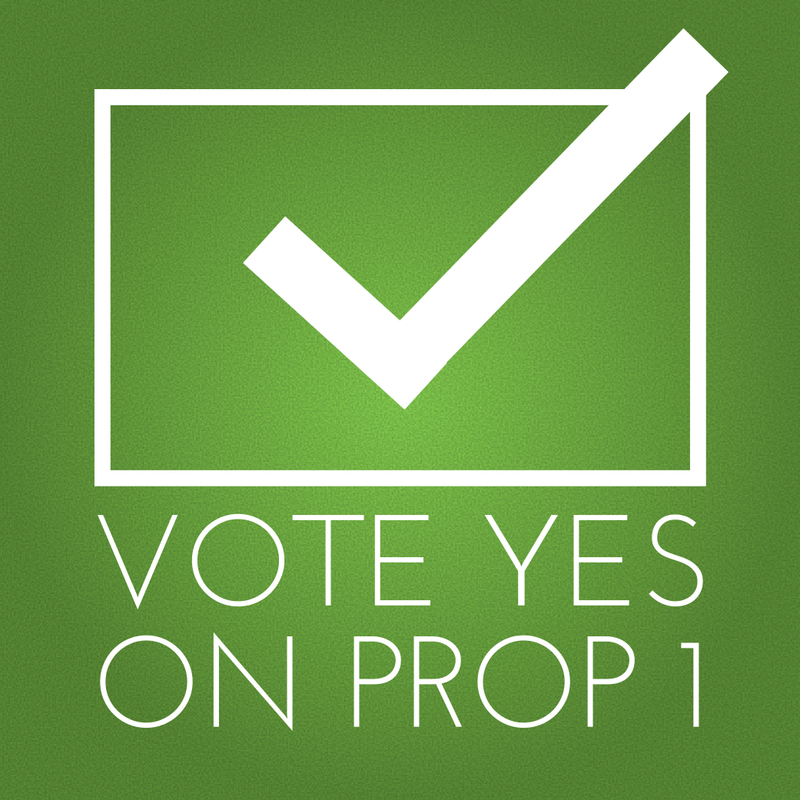 Vote YES for Prop 1! It lowers property taxes now and bans transfer taxes forever. 1) What’s a transfer tax and why does it matter? Simply put, it’s a sales tax on real estate transactions, usually levied as a percentage of the sales amount or a flat fee. For example, Nevada’s transfer tax is $4.10 per thousand of the sales price on every real estate sale. Considering the average sales price in Texas is $260,400*, the amount of transfer tax charged would be $1,066. Homeowners in other states are hit even harder. Pennsylvania and Washington pin a transfer tax as high as two percent of the sales price of each real estate transaction. This equals a whopping $5,208 tax on our average sales price, putting the dream of homeownership out of reach for many. Proposition 1 permanently amends the Texas Constitution to ban sales taxes on real estate transactions. This is a big win for current and future Texas homeowners. 2) Will Prop 1 cut funding for public education? No. The increased exemption is absorbed by the state of Texas. 3) Will my property taxes go down if Prop 1 passes? Yes. The state-mandated homestead exemption for public school taxes increases from $15,000 to $25,000 with the passage of Prop 1. As a result, every homeowner will pay lower property taxes. Many homeowners will see tax bills lower than the previous year. However, if a homeowner’s appraisal increases and local governments (like cities, counties and others) raise tax rates, your overall tax bill could be higher than the previous year’s. Even in those cases, your property taxes will not be as high as they would have been had Prop 1 failed. 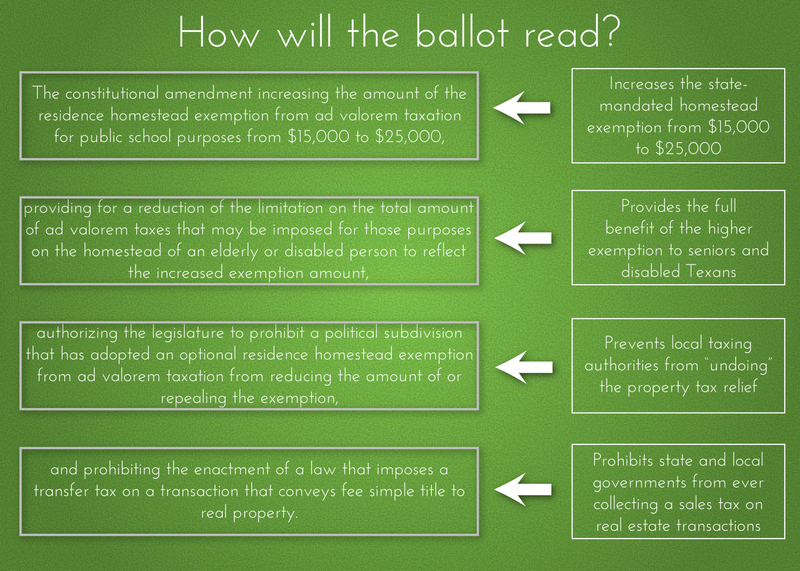 4) When will Prop 1’s tax relief become effective? Immediately. Your 2015 tax bill will include the higher homestead exemption. 5) How much will Prop 1 save my family? Every Texas homeowner will save about $125 per year.